"We are without a canopy. Approaching for landing in nearest base. 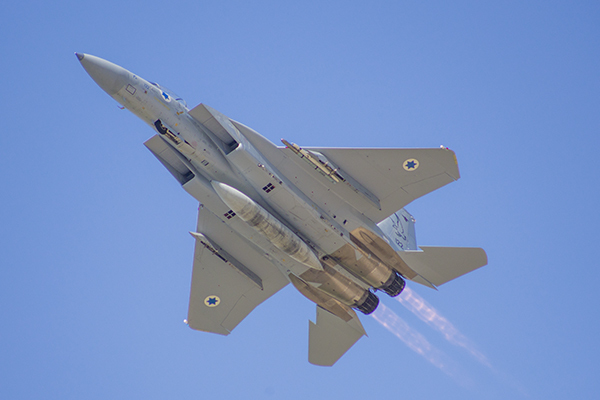 Calling Nevatim – immediate landing": last Wednesday, during a routine training sortie, a "Baz" (F-15) fighter jet performed an emergency landing after the aircraft's canopy had suddenly detached. The aircrew members handled the event and managed to land the aircraft safely in Nevatim AFB. The pilot, Capt. Y', and the WSO (Weapon Systems Officer), Lt. R', faced complex conditions with their lives and aircraft practically at risk, having been at an altitude of 30,000 feet and exposed to severe cold of -45°C in violent turbulence. After assessing that they would be able to land the aircraft safely, the aircrew members reported the situation to the ATC (Air Traffic Control) Unit and made their way towards the nearest airbase. The crew worked with courage, composure and professionalism while emphasizing their teamwork and mutual trust in face of difficult physical conditions. The aircraft landed safely and the aircrew members' medical results determined that they were fine. "The division was put to a halt and the event is being looked into", said Brig. Gen. Tomer Bar, Head of the IAF Headquarters. "The canopy detachment occurred at night during a routine training sortie. This is a rare incident, which has rarely occurred both in Israel and worldwide – thrice in F-15s over the past 40 years and once in the 'Ayit' (Skyhawk) aircraft. When an event of this sort occurs, there is a fine line between trying to land and deciding to eject. The aircraft landed safely in Nevatim according to the instruction to land in the nearest airbase". IAF Commander Maj. Gen. Amikam Norkin ordered to stop all training flights for "Baz" fighter jets until an investigation into the incident is completed. "The way the aircrew members handled the aircraft is worthy of appreciation", emphasized Brig. Gen. Bar. "The air traffic controllers managed to grasp the severity of the situation, and the controllers in the IAF Operational HQ helped the event end without harm. The event happened by complete surprise, with no early warning. The canopy detached and an explosion was heard in the cockpit. The aircrew members were exposed to difficult atmospheric conditions, suffering hypothermia and deafening noise". "The aircrew members' thoughts during such moments are whether the co-pilot is okay and whether they themselves are hurt", elaborated Brig. Gen. Bar. "The aircrew members operated according to emergency procedures and lowered their seats in order to block the wind. The pilot decelerated and the aircrew members screamed at each other. “As soon as they understood that they were both fine, they decided to land and radioed the control tower. The landing process was complex, but when slowing down and descending, it can be done safely. This was an abnormal technical event which luckily ended safely, and we will do everything in our power in order to understand what went wrong".